DAYTONA BEACH, Fla. – Trey Hutchens was destined to be involved in racing. Being the son of one of the most respected team engineers in NASCAR can have its pluses and minuses, but the 17 year-old is making a name for himself just fine in NASCAR’s regional touring series. Hutchens has added another award to his young resume – 2015 Sunoco Rookie of the Year in the NASCAR Whelen Southern Modified Tour. The second generation driver just completed his first full season driving a modified and finished a respectable 11th-place in the standings with a pair of top-10s in eight starts. He also competed in the NASCAR K&N Pro Series East in 2015 with two top-10 finishes in six starts. On driving both series during the season, Hutchens is happy for the opportunity but wishes he could have competed even more. One of the more impressive runs Hutchens had this season came in his second career start in the modified. After suffering major damage to his car in a practice crash prevented him from competing in the season opener at Caraway Speedway, the second generation driver rebounded to finish 14th at the same track two weeks later. 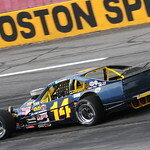 He then scored his first top-10 finish at South Boston Speedway the following week. His father, Bobby Hutchens, has also raced throughout his career in the NASCAR Whelen Modified Tour and Whelen Southern Modified Tours. While he has an established career on and off the track, the younger Hutchens doesn’t let that put any pressure on him to perform. For Bobby Hutchens, this year was a special one. The 17-year old senior at North Davidson High School isn’t one to brag on himself but he’s also finding success in the classroom as well as the race track. He is currently at the top of his senior class and was recently elected class president. The younger Hutchens also plans on following his dad’s footsteps and attend North Carolina State University and major in engineering. The teenager is the fourth generation of Hutchens to be involved in racing as his great grandfather, Claude, and grandfather, Bud, both owned cars at historic Bowman Gray Stadium. His dad has currently works at JTG Daugherty Racing. Judging by the caliber of person he’s become – those probably won’t be the only awards Hutchens will win in his career – on and off the track.